From the beloved author of Prayers That Avail Much® comes fresh inspiration for powerful living that will take you on a day-by-day prayer excursion toward Gods heart. Why does prayer matter in your day-to-day life? 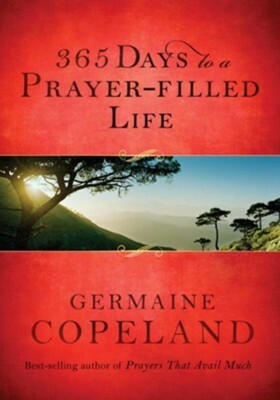 In a time and age where many have reduced prayer and God Himself to the "Great Vending Machine in the Sky," Germaine stresses that the primary goal of prayer is unbroken fellowship with the eternal God of heaven and earth. 365 Days to a Prayer-Filled Life will encourage you to dig deeper and gain a stronger understanding of the purpose of prayer by unpacking core Biblical themes such as joy, unity, spiritual gifts, overcoming fear, the Holy Spirit, walking in love, and the power of words. Each days entry includes a Biblically informed message, a Scripture-based prayer, and a suggested Bible reading. For anyone who wonders if Gods Word and prayer can make a difference, and for those who long for a closer walk with God, the devotional entries in 365 Days to a Prayer-Filled Life are clear: God loves you and wants to impact every area of your life. His promises are true&hellip;and His mercies are new every morning. GERMAINE GRIFFIN COPELAND has been passionately helping others discover how to claim Gods promises through prayer. As the founder and president of Word Ministries, Inc., in Monroe, Georgia, Germaine has counseled, pastored and taught with a tireless commitment to see lives changed by prayer for over thirty years. She is also the best-selling author of more than twenty books on prayer, including Prayers That Avail Much. She travels nationally and internationally conducting prayer schools as well as speaking at churches, conferences, and other groups. 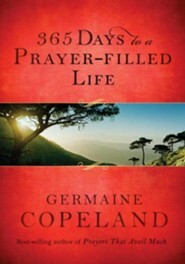 I'm the author/artist and I want to review 365 Days to a Prayer-Filled Life - eBook.